By lavender at Sep. 29. 2016. As happy as we are to see the glories of spring, said glories are closely followed by the emergence of weeds that overrun our gardens and yards. If the area under cultivation is small. due diligence with a good weeding implement is generally all that is needed. However, if a much larger area needs to be weeded we often find ourselves resorting to various chemical weed killers. Removing weeds from between bricks and sidewalks can also be difficult task if attempted by hand. There are many different week killers out there. Some are selective killing only grasses or broad leaf weeds, while some will kill anything that they are sprayed on. Most of them are systemic meaning that they are absorbed into the plant and kill the root as well as the leaves. While these chemical weed killers have their place, many home gardeners do not wish to use them for health and environmental reasons. There are many, many weed killing solutions available that use household products or are as simple as pouring boiling water on the unwanted plants. Most homemade weed killers are solutions of salt, vinegar or liquid detergent singly or in various combinations and strengths. How well do these kitchen weed killers work? That depends on what you want to do with them. Vinegar is acetic acid in a 5% solution. Sprayed on a plant it acts as a desiccant pulling water out of the cells. That will definitely kill a leaf but will have little effect on a well-established root system. The vinegar is not taken up by the plant and transported to the root. Repeated sprayings will, of course, eventually kill the roots as their energy will ultimately be depleted as each new batch of leaves are killed before they can renew the food supply stored into the roots. This can take a very long time with a well-established tap root and the spraying must be done frequently. On young weeds vinegar may be very effective as their root systems are not well established and the destroying of the leaves may be sufficient to kill the plant. Vinegar is non selective and will burn whatever it touches, although a light over spray will probably not kill desirable plants. Vinegar will lower the pH of the soil depending on how often it is applied and in what concentration. This may or may not be desirable depending on the current pH of the soil. Salt works in much the same manner. It too is a desiccant and destroys leaf tissue by pulling water out of plant cells. It is non-discriminatory and is not absorbed into the plant. Unlike vinegar it can have disastrous effects on the soil. Roots draw up water by osmosis. In normal soil water is drawn across the cell. membrane because the concentration of dissolved minerals is higher in the cells than in the soil. Water is passed into the cell through the membranes in an effort to equalize concentrations. A high concentration of salt in the soil will result in just the opposite and water will be drawn out of the root cells killing the plant. In age old tradition retreating armies salted the soil so nothing could be grown on it and this is just what will happen if too much salt gets into the soil. Not only will weeds die but the desired plants will not grow either. Liquid detergents are not going to kill plants but they act as a surfactant. They dissolve protective waxes on the leaf surface and make the other ingredients more effective. Detergents are always used as in addition to other ingredients. 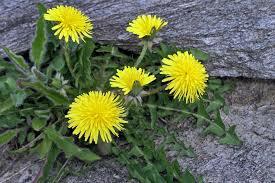 The following is a weed killer that has become popular of late: 1gal vinegar, 2cups Epson salts ¼ cup of Dawn blue. The Epson salts take the place of regular salt (NaCl or sodium chloride) Epson salts are magnesium sulfate (MgSO4) and are often used in the garden, especially on peppers and other crops that like high levels of magnesium. One reason that it is so popular is that it is highly soluble and can be used in foliar feeding. It therefore doesn’t seem likely that it is going to kill weeds. If you try this one we suggest you replace the benign Epson salts with good old table salt. And remember that household products are chemicals too.